In Rosette Diceless, anyone can be a Narrator and introduce story. You don't have to take a turn as a Narrator, of course: you contribute to the ongoing story just by playing your own character and perhaps occasionally narrating an event informally. If you're going to run a Narrated scene, however, it can feel a bit daunting. There's a lot to keep track of, and with such a freeform system as Rosette Diceless, you should be ready to handle a wide array of things that the other players will throw at you. So how do you prepare to run a story that includes a full Conflict scene? If you'd like a peek behind the curtain of a narrator's planning, consider taking the following new Positive Trait. At any time, you may request the Attributes (and/or Defenses) of any Adversary, Expert, or Extra and the Narrator in charge of them must share the numbers with you. The full details of planning an RPG plot are outside of the bounds of this article, but your initial concept should present a crisis or obstacle of some sort that the other players have a reason to be interested in confronting. It should allow for multiple approaches and not be easily avoided or bypassed by the abilities the player characters possess. Once you have this concept, note down what you want the player characters to learn or experience before Conflict begins. There may be news pieces, provocative events, or suspicious activities that will initiate the storyline. Don't make the players search or struggle for this exposition: if it's necessary for the story, just provide it to them in a way that feels natural. Now decide where Conflict is likely to start. Don't be afraid to start a Conflict much earlier than you would start combat in other systems. As soon as the players start working toward a Goal and their success or failure is interesting, initiate Conflict. When planning, note a few Goals that you can imagine players pursuing. Try and make them broad to have a better chance of encompassing what actually arises in play. Once you have exposition and Conflict Goals planned, you're ready to design the Conflict itself. The numbers involved in designing a Conflict are laid out in the Narrating chapter of Rosette Diceless, but there's more to good Conflict design than simply knowing the stats. Figure out what your core Adversary should be. It can be as specific as "Professor Winters" or as general as "The Apathy of Humanity." The former would lend itself to a very narrow Conflict where turns take seconds or minutes, while the latter could be wide-ranging and have longer turns as players try to affect large groups. When you give your Adversary Skills, think about the broad range of situations and approaches your players could come up with. It can be helpful to think of what aspects of your Adversary you want to highlight, as these sorts of character descriptors can be more versatile and interesting than generic abilities. "Chilling" or "You Reap What You Sow" are Skills much more ripe for interpretation and drama than "Freeze Ray" and "Riposte." Think of a few Crisis Attacks that you might use. These Attacks are important to a Narrated Conflict because they force the players to be at least a bit reactive, making the Adversary seem more like a challenging figure with agency instead of just a punching bag. Pick crises that fit the player characters you expect to participate in the Conflict, both as ways to show off their specialties and demonstrate their flaws. Plan out a few Extras and Experts that you may want to add to the Conflict. These work best when you envision obstacles and complications that aren't a direct result of the Adversary, but work to block the Goal or further the potential Consequences. You don't have to end up using every one of these characters, but it will be useful to have some planned out to use in a pinch. When you have your Conflict mostly planned, take a moment to review it and make sure that it works mechanically. Do you have decent Attributes and several Skills for the Attacks you expect to use most often? You don't want to be repeatedly making an ineffectual Attack. Is the most likely Defense for the player's approach high enough? You don't want your opponents to be impossible to hit, but it's also not interesting if the players succeed on every Attack. You should organize your notes however works best for you. 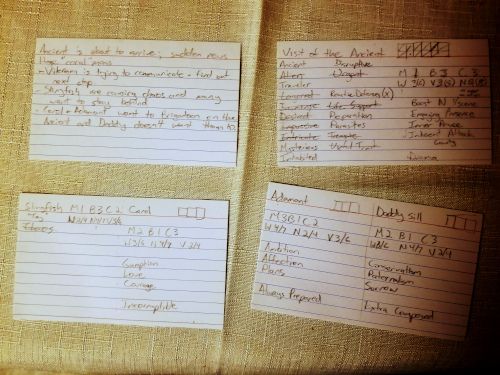 Gregory usually uses several index cards as shown below: one for basic exposition notes and one for the Adversary and each Extra or Expert. The character cards double as tracking cards for the Conflict order. Their notes tend to be rather general and high-level, which means they often are improvising responses to player actions or repurposing parts of their plan when it's clear things are going in an unexpected direction. Melissa, on the other hand, tends to make extensive notes in a document, requiring more planning time but making them more prepared for a range of actions by the players. Whichever way you want to organize your notes, you don't want them to be so brief that you find yourself making everything up on the spot, and you don't want them so detailed that you have trouble finding the information you need among the unused bits of potential story.